Last year’s flu season was severe in most parts of the country and left many wondering why the flu vaccine hadn’t performed more effectively. However, it remains our best line of defense for averting and lessening the severity of this common but potentially deadly illness. Below we clear up some of the most common misconceptions about the flu vaccine…and continue to strongly recommend that you make sure to get your shot of prevention this fall. Myth: I can get the flu from a flu shot. A flu shot will not give you the flu. The viral strains in injectable influenza vaccine are inactive and biologically unable to cause illness. The one exception is the vaccine administered in nose spray form. Myth: The vaccine didn’t work last year, so it must be losing potency. The amount of protection provided by flu vaccines varies by influenza virus type, and how well matched vaccine viruses are to the circulating flu viruses. 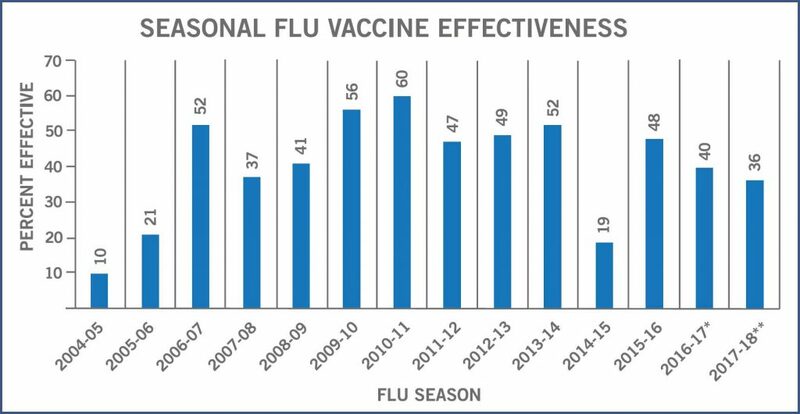 Last year’s results, while lower than average, still meant that the risk of getting sick from flu was reduced by a third. This year, both types of vaccines, trivalent (protection against influenza A H1N1 and H3N2 viruses and one type of influenza B virus) and quadrivalent (four component protection to protect against two types of B viruses), have been modified to better anticipate the season’s circulating flu viruses. Myth: The flu vaccine will also prevent other viruses. Flu vaccines do not protect against infection and illness caused by other viruses, such as rhinovirus (one cause of the common cold) and respiratory syncytial virus (RSV), despite their flu-like symptoms. Myth: Flu vaccines are not appropriate for people over 65, who have weaker immune systems than younger people. Although immune responses may be lower in the elderly, flu vaccine effectiveness has been similar in most flu seasons among older adults and those with chronic health conditions compared to younger, healthy adults. It’s also important to remember that people 65 and older are at increased risk of serious illness, hospitalization and death from the flu, making the flu vaccination especially important for this age group. Myth: There are no flu vaccines just for people over 65. There are two vaccines designed specifically to help enhance the effectiveness in adults older than 65. A high dose vaccine, containing four times the amount of antigen as the regular flu shot, and the adjuvanted flu vaccine, which creates a stronger immune response in the elderly. Myth: The vaccine is less effective if received every year. Multiple studies have shown that while immune responses to vaccination may be higher among people not previously vaccinated, those who are repeatedly vaccinated still have increased immune responses and are provided protection against the flu. Myth: I should wait as late as possible to get immunized so it lasts throughout the season. 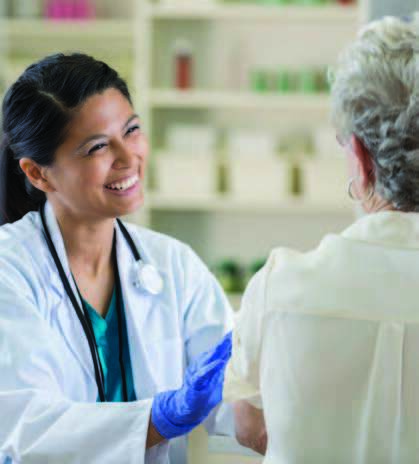 The CDC and Advisory Committee on Immunization Practices (ACIP) recommends that you get a flu vaccination in early fall to ensure you’re protected before flu season begins. However, as long as flu viruses are circulating, it’s not too late. Receiving a vaccination in December or January can still protect you because flu season often peaks after January and can last as late as May. Myth: Getting sick with the flu is not all that serious. In the U.S., 36,000 people die and more than 200,000 are hospitalized each year because of the flu. Children, the elderly and people with certain chronic conditions (heart disease, lung disease, asthma or diabetes) are at higher risk for complications such as pneumonia. For everyone, flu symptoms, including fever, headaches, cough, sore throat, nasal congestion, extreme tiredness and body aches, can disrupt work and social life for up to two weeks. The flu vaccine has proven effective in both preventing flu and in lessening the severity of symptoms if flu should occur, thereby reducing the risk of hospitalization and admission to the intensive care unit. Up to 60% – Decrease in the risk of flu during seasons when most circulating flu viruses are well matched to the flu vaccine. Put another way, in 2016-17, the vaccine prevented an estimated 5.29 million illnesses, 2.64 million medical visits and 84,700 hospitalizations associated with flu. 79% / 52% – Reduction in hospitalization for people with diabetes (79%) or chronic lung disease (52%) as a result of receiving the flu vaccine. The post A Flu-Free Winter: Your Best Shot appeared first on Specialdocs Consultants.